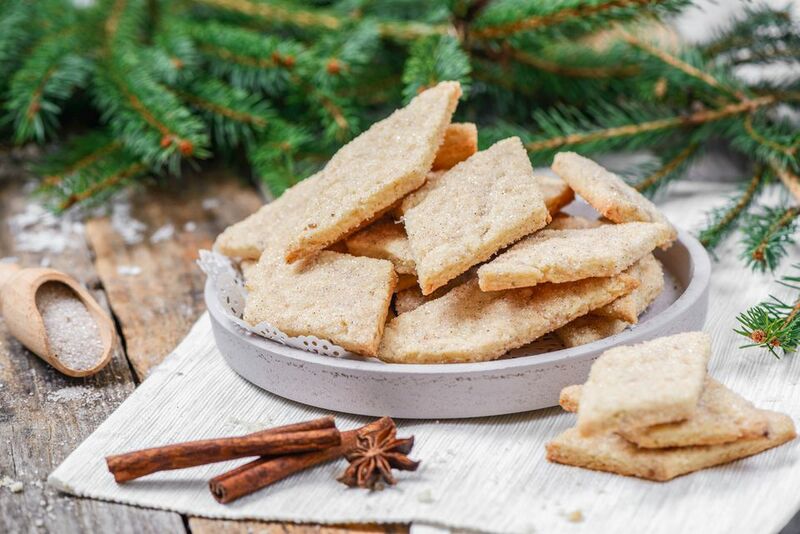 In Santa Fe, every household makes anise-flavored cookies called ​bizcochitos around Christmastime. Delicately, crumbly, and flavored with anise seed and cinnamon, the treats are delicious with a mug of hot chocolate. In a stand mixer or a bowl with a hand mixer, cream together the shortening and 3/4 cup of the sugar until smooth. Add the eggs and aniseed and mix well. In a separate bowl, sift together the flour, baking powder, and salt. Add to shortening mixture. Add enough water until dough clumps together, about 1/4 cup. Turn the dough out onto an unfloured surface and roll it to a thickness of about 1/8 inch. Use a pizza cutter or a knife to cut the dough into diamond shapes. You can also cut out using a cookie cutter. In a small shallow bowl, combine 1/2 cup of sugar and 2 teaspoons of cinnamon. Dip the top of each bizcochito into the cinnamon-sugar mixture and place on an ungreased sheet pan. Bake for 10 minutes or until edges begin to turn golden. Do not overcook; you want them to be a little soft. If desired, sprinkle hot cookies with additional cinnamon sugar before transferring to a baking rack to cool.